Nope, not strange at all. It might be cool and all, but it doesn't offer a truly ground breaking advantage. Add to that budget cuts in pretty much every army, stockpiles of old grenades and no actual demand for such a weapon and you'll sit on that thing forever. Selling it to the US Army? But it's not made in 'Murica! SF? Their current fashion is 'back to the roots', keeping the rifle light to improve handling and rather go with stand alone launchers again. Current users of the AUG? Lots of LE and many nations that don't exactly have huge budgets to begin with. EDIT: After going through history, I see much of this is already addressed... never mind. I would suggest some changes in advanced repair system, in particular, to make player somehow able to repair items on his own. One idea would be, to repair up to % matching the mechanical skill. Other idea would be somehow making it related to technician trait. Yet another idea would be to make some heavy item, or to make facility in some sectors that will allow such repairs (and maybe make it a new occupation different from repair, so that this is managed separately). In previous releases, I would use repair shops in Cambria early-mid game (Perko). Particular use would be to buy damaged stuff (armor mainly) in local shop, give it to Perko while my mercs would focus on repairing normal stuff with minor damage: early on there isn't that many mercs (but also not money to spend excessively around on) so it's welcome bonus to give it to NPC while your mercs are mainly occupied doing other things. However, restricting the repairs so completely as this does to very few places(which places actually allow this, I think Perko won't touch weapons anyway, no?) that allow something like this, is I think too tough, and not very realistic - and amount of added micromanagement does not justify for additional realism it may bring. There is something I'm also wondering about - how does this dust and damage system affect AI (army and militia)? Does damage/jamming apply to them, and does dust apply to them, and how does it accumulate for soldiers in other sectors, and if it does apply, is AI able to deal with it (will I find cleaning kit with elite troops corpses most of time, and what about militia (especially with mod that enables/requires giving it equipment), please? This is probably because the maps were made for older version, so some items don't have correct data. Also, sometimes items with 0% max repair limit and good current state (like 75%) can be found on maps/dropped from enemy. These weapons can shoot normally which is strange. Is it possible to add some check/fix for the items with incorrect data (probably from old maps)? Both sawed-off and kevlar helmet are damagable/repairable in items.xml (using stock default xml data). Tested with stable r7609 with Wildfire 6.07 maps from svn, default ini options. If I remember correctly, some preplaced items get a max repair limit of 100%. And I also think 100% is not displayed... to test that... can you repair these things? Can confirm this, I can say it's a bit confusing for the player as he cannot see the max repair level and thinks maybe it's a bug. can you repair these things? Yes they can be repaired to 100%, so this issue is solved now, thanks. One problem that is still here is that sometimes guns can be found/dropped with actual status much higher than max displayed status (like 75%/0%), and they act like they are ok.
Is it posssible to add some check/fix to the code for such situations? This happens in wildfire maps, for example in C3 with weapon cache you can find SKS with 86%/0% status in a closed guarded building. It cannot be repaired by mercs with default settings, but if I set MERCS_CAN_DO_ADVANCED_REPAIRS = TRUE, tech merc can repair it to 100%. So the problem is with some preplaced items (not sure about dropped items that were given to enemy in editor) which have 0% max status and the game doesn't check that actual status much higher than max, also those items work (shoot) as if they were ok which looks strange. Actually I don't see this as a big problem. Just consider such item as a goodie that you can use as long as it works but if you want to continue using it you need to bring it to some specialist NPC or a merc with technician trait if you have set MERCS_CAN_DO_ADVANCED_REPAIRS = TRUE. It may even be a feature instead of a bug. The "/0%" only means that it cannot be repaired by normal folks. It doesn't mean that it's broken. As of r7867 & GameDir r2244, in order to keep trait-related settings where traits are defined, MERCS_CAN_DO_ADVANCED_REPAIRS has been moved from JA2_Options.ini to Skills_Settings.ini under [Technician] settings. Dirt was an artificial extra parameter that was already covered by gun status (at least in my and other players' opinion). Cleaning dirt was an instant action that we did by pressing a button. Anybody that ever had to clean guns knows that this takes time and is not done in the middle of a firefight. Dirt added to an already high chance for gun jams. Gun status is composed of a dirt value and a repair threshold (if ADVANCED_REPAIR = TRUE in Ja2_Options.ini, default and highly recommended). If advanced repairs are off there is only the dirt value. The dirt value reflects how dirty the gun is. The repair threshold reflects actual damage to the gun. So if your gun shows 100% it means that is has no damage and is perfectly clean. If the gun shows for example 87%(98%) it means that its status is composed of 11 points dirt and 2 points damage. Only special NPCs or mercs with Technician trait can repair the repair threshold (if MERCS_CAN_DO_ADVANCED_REPAIRS = TRUE in Skill_Settings.ini). No change. Gun status can go down when you fire a gun. No change. Gun jams are more likely to happen when the gun status is low. No change. When gun jams happen there is a chance that the gun gets damaged. The chance for damage is higher the lower the gun status is. So keep your guns in good condition and they will work reliably. Dirt can be removed with the help of cleaning kits. This requires the "Repair Items" assignment from now on. Gun cleaning goes 5 times faster than gun repair but you still have to spend enough time on that assignment to make it count (MINUTES_FOR_ASSIGNMENT_TO_COUNT in Ja2_Options.ini). There is a new option "CLEANING_RATE_DIVISOR" in Ja2_Options.ini that affects the number of cleaning points a merc gets. In order to clean guns the merc needs to have a cleaning kit anywhere in his inventory. You can only clean up to the repair threshold, not beyond. Gun cleaning has priority over general item repair. Cleaning checks all guns of all mercs in the sector. So a single merc could clean all guns on his own. This can come in handy if you don't have many cleaning kits. Of course it's faster if more mercs share the workload. If you do not have a cleaning kit you can still clean your guns with the normal repair routine and the help of a toolkit but this is much slower than using cleaning kits. Consider this the "backwards compatibility" for people who refuse to buy cleaning kits. I wanted this change to be as user friendly as possible so people don't have to change the way they play (besides removing the option to instantly clean everything ). At first I wanted to apply dirt value changes over time when an item is in a certain sector for a period if time (feature of the old dirt system) but I decided against it. The reason for that is that we can't lock items away in a locker or crate to protect them from dirt and I didn't want to cause frustration about constant drop in gun status for just lying around. If there is a strong request for such feature it could easily be implemented in the hourly update function. Keep an eye on the dirt modifier of guns in the advanced tab of EDB. Some guns have pretty high values there which means they get dirty faster. The M16A1 is a notorious candidate for example. Ammo can also affect the dirt modifier. Looted weapons with a high repair threshold are now worth to quickly be cleaned and used against your enemies in the next battle. Try to keep the gun status above 85%. Below that the guns jam a bit too often for my taste but that has always been this way. Always have at least a sidearm with you so you can switch guns when your primary weapon jams/breaks. While I was at the code I also fixed some bugs in repair assignment handling. It should now properly reflect if a merc can repair/clean something, if he doesn't have the skill/tools or if he's done. One more thing. This was quite a drastic change and I was only able to make a few tests. So if you encounter any bugs please report them here. Also if you feel that status goes down too fast/slow, gun takes too much/little damage during jams (I capped it at max 5 points per occurence) please drop a line. Balancing is important. I don't want this new mechanism make the game too easy or frustrating but for the right balance we need feedback. First of all: I like your changes and they do make sense, so no problem there generally. Also, some questions regarding the new repair system: Does this mean that you need MEC to clean guns now? Gun-cleaning skills drilled into recruits are a far cry from actual engineering skills, so I would really object to a situation where low-MEC soldiers take hours cleaning there guns. What do you consider the "default" setting in your new system? If set to only allow Perko and Arnie to actually repair weapons, doesn't that completely invalidate all the engineers? Biggest problem: Guns jamming can very quickly lead to the gun being ruined (dropping to 1%) - does this affect the dirt status only or does this reduce the threshold to 1% as well? The latter would be terrible, because this would mean a rifle in pristine condition could very well be utterly destroyed in single Tixa defence. That's good to hear. I haven't had time to play the game lately so I couldn't really try the new system myself. How many bullets did you fire? I tested with several weapons including a MP5K and MG36 in semi-auto and auto fire where I fired at least 10 full clips without the gun building up too much dirt. I experienced a few jams which should be normal if you empty multiple mags in a row in a "clean" sector. I got the MG36 to overheat which increased gun jams but that is an intended feature of the overheating system. I have to admit that I didn't test in a desert sector but your feedback gave me an idea. Building interiors should usually be cleaner than outside so I might just halve the dirt penalty inside buildings. The game uses the same formula for cleaning that it used for repairing the status in the past which includes the Mechanic attribute. I didn't change that but you have a good point. Gun cleaning isn't rocket science so I guess I will modify the formula so that MEC plays a lower role and DEX is the main factor plus a little EXP. With that change mechanics will still get a bonus. MY default setting is MERCS_CAN_DO_ADVANCED_REPAIRS = TRUE. This isn't what the standard 1.13 GameDir is set to at the moment but players can easily change that. It's only required to repair actual item damage (repair threshold) so you can still run around with a 95/95 gun which will work fine or you change the option or bring your guns to one of the NPCs. Every time a gun jams it might take some amount of damage (0-5 points) so if you keep firing a low condition overheated gun you have a good chance to break it. Chance for damage is minimal if your gun happens to jam while it's still in good condition but if you keep pushing the status downwards it will eventually take damage. If you stress a gun hard from 100/100 you might end up with a 50/85 status for example. That's what's intended and I don't plan to change it. The system is not designed to allow sector defense with a single merc against an army. If you plan to do that you better provide multiple weapons he can use and clean afterwards. Btw. keep in mind that semi-auto fire has a lower chance for gun jams than auto fire. In the case of the Mini-14 it was half a magazine (<15) that caused constant jamming. Mind you, this gun doesn't even have full-auto or burst fire. I thought it was linked to Shank's poor skills, but now I now it was due to the sector being classed as desert. If you can indeed code the interiours of builidings to behave differently, that would be a really elegant solution to the problem. Alternatively, could Tixa be changed from Deseert to Urban? I had a similar idea after having posted this yesterday and considering how DEX is currently inconsistently distributed among mercs, I feel the best and most realistic option would be to link cleaning speed to EXP, following the logic that the more of a "soldier" you are, the better you are at maintaining your gear (just like Major Pain, doing it blindfolded and hanging upside down^^). By reducing the amount of readily available gunsmiths Perko and Arnie become more valid option. I would like to second the request for more shopkeepers, by the way, as especially in third world countries, tinkering and repairing of stuff we would simply through out and replace is quite an important part of local economy. Plus small mom and pop shops are more abundant in a poor economy than in a wealthy one. I wasn't talking about one-man defence against an army, but rather against attack squads of 12 or so enemies. Regardless of the number of enemies, a rifle in acceptable condition should be able to fire more than 20 or so bullets (in single fire!!!) before it is utterly destroyed just from jamming due to dirt. Just one other thing that came to my mind... does it really make sense, that you can never fully "clean" a gun just because it is damaged? What I am trying to say is that if a gun in perfect condition starts acting up when it gets 15-20% dirty - why would a smaller amount of dirt cause the same amount of trouble for a gun in a slightly damaged condition? If the first condition of the gun is really the cleanliness of the gun, shouldn't that always go up to 100% after a full clean? I tested the Mini-14 in Tixa. The first jam happened on the 6th clip at 77/97 status and high gun temperature. That's 170 bullets down the range. For a desert sector this isn't bad. Status after 10 clips was 49/86. I might up the threshold for gun damage a bit so it takes more dirt before a gun will take damage but I wouldn't want to change dirt accumulation. If anything I could make it dependent on shooters stance so it takes less dirt when standing and most when prone. This is what I figured and what I am going to do, simply because of the limitation of smiths in Arulco and the massive drain on your logistics of ferrying around rifles through the country just to have them repaired. It does, however, completely undermine Flugente's original intention behind the advanced repair system, doesn't it? I think the better (and best, imho) solution would be a small addition to the current skill system, seperating lockpicking skills from proper engineering skills and fortification skills. As things stand currently, the "real" reason Perko and Arnie remain unused is because the game gives you too many cheap/free Engineers to start with. Using the advanced repair system is a players choice just as using the tech trait for repairing the thresholds. There is nothing wrong with that. In vanilla there wasn't even something like repair thresholds. Anybody could repair any item to 100%. I like the advanced repair system but I also feel that my engineer should be able to do the same as Perko, the engineer, so I always enable MERCS_CAN_DO_ADVANCED_REPAIRS. I think that is just in line with Flugente's original intention. Anyway, a trait system overhaul is out of scope so either engineers can repair the threshold (if the option is on) or not no matter what type of item it is. Okay, I am okay with the system as it is currently. Basically what I don't like is that freshly looted guns are now more or less useless. If I defeat a group of enemies and give best of the looted rifles (drop all being activated, of course) to a merc (usually at 80+/90+), I am almost guaranteed jams before emptying the first magazine. 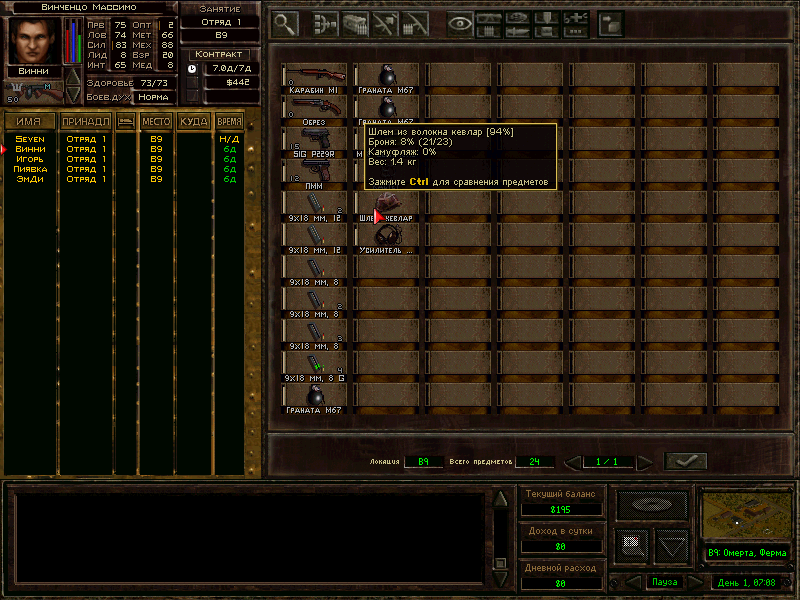 Happened to Shank with two seperate guns, happened to Razor, happened to Hurl, I am paying attention to this now and I just find it a bit odd that the Arulcan army doesn't seem to stock a single weapon that would realistically survive even a medium sized confrontation. I guess the way to adress this is to clean/repair every gun before using it, but that doesn't explain why every single one of Deidranna's soldiers seems to run around with a filthy. damaged gun to start with. As regards Flugente's intentions behind advanced repair, obviously I cannot speak for him as he can do that himself, but the way I understood it was that his main motivation was to force players to use Perko and Arnie. With your changes, this motivation is undone, because it no longer makes any sense not to activate "MERCS_CAN_DO_ADVANCED_REPAIRS". You only have two options now: Either you make your Engineers (two of which you get for free!) more or less useless, because "cleaning" is easy enough for every merc to do himself and should be, as it needs to be done all the time, and actual repair can only be done by Perko and Arnie OR you revert to the state where no-one will ever use Perko. Please don't get me wrong, I don't have a problem with that and I will keep playing with mercs being able to do advanced repairs. especially since advanced repairs are now "standard" repairs, but this is how I have interpreted Flugente's posts. Btw, do your changes in any way affect armour and other gear that is not usually cleaned? Guns jamming frequently at high status values might need a little tuning on the jam code. People have been complaining often enough that jams happen too often, long before the advanced repair, old dirt or new dirt system. When Sevenfm finds the time he will implement his changes to gun jams for enemies which seems to work well in his experimental build. I guess then we will see if jams happen too often and maybe then we may need to find a better formula. Btw. even before the new dirt system guns could take damage that lowered the repair threshold so the only thing that changed is that we have one more condition now that can damage a gun. Once I adjust the threshold for gun damage this will be a non-issue as long as you don't brutally abuse your gun. At that time you could leave MERCS_CAN_DO_ADVANCED_REPAIRS disabled but in that case you will have to bring a lot of the loot to Perko or Arnie because army weapons will still be in damaged condition most of the time just like in the old system. My changes have no effect on other gear than guns. You don't need to wash/clean armor or other equipment. That problem is as old as the game -- in the Map Editor, for my mod, I have set every soldier's gear to "GREAT" - the highest quality setting. The result: dropped items range from 80% to 100%, Somewhere in the code the range for "GREAT", "GOOD", etc is defined, and if we bump it up a bit so "GREAT" is 90-100, "GOOD" is 80-90, "FAIR" is 70-80, "POOR" is 60-70, and "BAD" is 1-50 I think that will solve issue of the Arulcan Army's severely substandard equipment. I came to the conclusion that it's probably best to not just modify the code internal level for gun damage chance but to externalize it to Item_Settings.ini. This way we can set different levels for different gun types. I imagine something like shotguns with a very low level so they can almost not be damaged by high level of dirt. For rifles the level will be slightly higher, ARs and SMGs will probably have the highest level because of their complexity, LMGs will have a somewhat lower level because they are build to survive heavy fire and so on. Nice side effect is that players can adjust this to their liking. Gun damage level (threshold) will reach from 0 to 100 just like the status so if it is set to 30 for example that gun type cannot take any damage during jams if the gun status is still above 30. The levels above are very forgiving so you can have multiple fights in a row without cleaning guns in between even in the desert. Too forgiving perhaps? On the other hand it allows players to directly use the loot that they find. I'm not familiar with the new code, but wouldn't it be enough to adapt <DamageChance> and <DirtIncreaseFactor> in Items.xml, as those tags were made for this feature? Only problem is that <DamageChance> is almost always 10 no matter if it's a pistol, rifle, SMG or AR. I may be able to use the <DamageChance> tag and new parameters from Item_Settings.ini as multiplier so it won't be a fixed value for a certain gun type but different values depending on Items.xml (if someone ever overhauls <DamageChance> there which is unlikely...). Wow. sounds like some really promising developments since I last checked in. You lost me a bit in the jargon, but if looted guns become usable, that would be fantastic. Are <DamageChance> and <DirtIncreaseFactor> going to create the same effect your new damage threshold would have done? Jam damage thresholds have been added to Item_Settings.ini - as long as a gun's condition is at or above the threshold for its type it will not take damage when it jams. <DamageChance> comes from Items.xml. The formula makes sure that the lower the condition of the gun the higher the chance for damage gets. Also the possible amount of damage is higher the lower the condition of the gun is although there is a rather low cap of 5 points. This means that EXP level is now 5 times as important and DEX is now 3 times as important as before. Even a loser with 0 MEC, 50 DEX and Level 1 can now effectively clean his gun, not as well as an average merc but at least he can. Any reason why despite having the dirt system set to true I still don't see any dirt in mah gunz? Could be because they a) are not dirty or b) you are using a newer exe which changed the way dirt works. In case of b) please read a few of the earlier post on this page to see the changes. I'm using Revision 8403 Game Dir 2363. If I read the post correctly, I need to have ADVANCED_REPAIR = TRUE for the dirt system to work, correct? Because I currently have it set to FALSE but I still see the dirt properties in my gun properties window, even though it seems to have no effect. Maybe there were certain properties that weren't suppressed in the description box when the dirt system was turned off. Just ignore them. Hello, i agree with the dirt system change. However, after having not played in a while and starting a new playthrough i noticed the dirt removal and didn't know cleaning kits still had a use. So all this time i have been using toolkits to repair stuff suboptimally when i could have ordered a $20 item to increase the speed :/. How about we keep the system as it is but remove the need for cleaning kits? Or just add the cleaning kit function to the toolkits as default? I want to increase a chance of permanent mechanical damage during weapon jams (repairable only by gunsmiths). How can i do that? EDIT: Ok, I figured it out. EDIT 2: I did some testing and it turns out the hotter the gun is the less dirt it accumulates which is weird. Also the the chance of permanent damage during jams is too low. My gun can jam hundred of times and it will not take any mechanical damage whatsoever. What's the point of permanent damage system if the gun do not degrade? EDIT 3: So I increased "damage chance" for every single weapon in items.xml to 450 (luckily, I was using notepad++ so I didn't have to go through all 340 weapons manually) and now every time the weapon jams, there's a high chance it will take a little bit of permanent damage. The original "damage chance" numbers were terribly low and the whole feature was nearly completely non-occurrent. Luckily it's tweakable and now the equation makes sense. Silversurfer, what were you drinking when writing those numbers? Absinthe or two? Playing with UC/1.13 I cannot get a "clean guns" option despite Advanced repair/dirt being TRUE. "Control" + "." gets me "Fill Canteens" "Take off clothes" and "improve gear" with another 5 "unused" options. I remember playing a few years ago and it was working then so presumably I have stuffed something up. There is no "Clean Guns" action anymore. Dirt is now part of gun condition (explained above). To remove that you need to put the merc on repair assignment and either have a cleaning kit (preferred) or toolkit in your inventory. Be aware the cleaning with a cleaning kit goes much faster than the usual repair with a toolkit. Thanks - I skim read the 3 pages and obviously misunderstood it. You might want to improve alt. version of adv. repair feature. I suggest following: your merk can do adv. repair if both of requirements are fulfilled. I am evoked for this suggestion because repairman like 25 mech + tech perk can do it and like 95 mech + repair facility NOT looks very wrong to me. Something similar may be applied to healing traumas. Unless you changed the default ini settings there shouldn't be any IMPs with tech trait that have mech <45 or <60 because those are the minimum requirements for the trait. If it's mercs from AIM or MERC then their attributes may need to be looked at. We shouldn't have techs that have insufficient mech skill. All right guys, so I've got another question regarding permanent mechanical damage system. 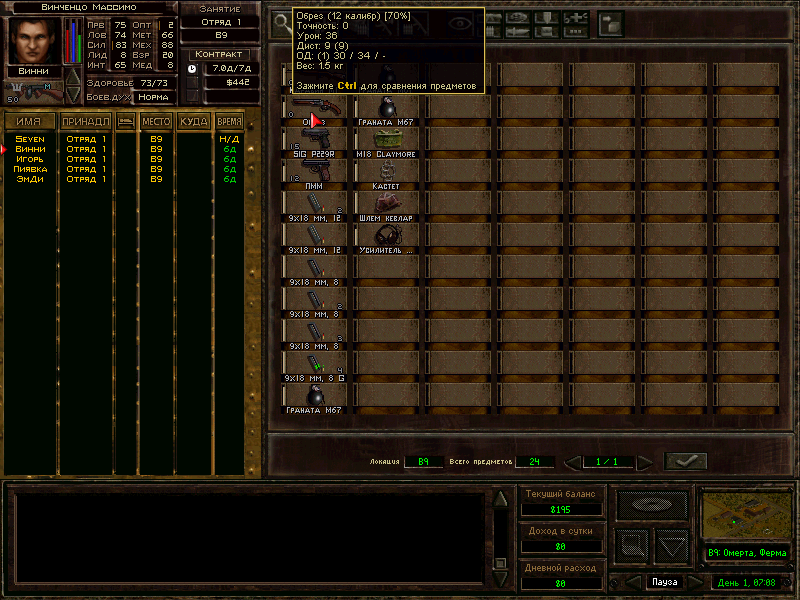 I already know how the things work for weapons but I see the system also works for armors too but I don't know how. How do armors get permanent damage? Sometimes, when I pick up armor from the enemy it already has some permanent damage but how do full condition (100%) armors get damaged permanently like weapons during jams? If I recall they do so by taking damage, either from being shot or being blown up. It can also happen by damaging them with failed skill checks, but that's likely not what you are searching for. It seems in a few cases the <DamageChance>-tag isn't used, instead we use out usual hand-wave formulas (similar to how the threshold of times we create below 100% is handwaved).